I've been searching for the perfect pair of brown riding boots since last year, and I finally decided to fork out the money for the ones I wanted. Over the past several weeks I've been searching for ones that I liked. I'm pretty particular, too. They have to be flat. As flattering as high heeled boots look on my 5'2" frame, they are impractical and I will never wear them. They have to be leather. I don't mean to sound snooty here, but fake leather boots really bug me. They look plasticy and fall apart after one season. They have to be the perfect shade of tan. Not too dark because it's verging on brown, which I already have. Not too light because they get dirty. They have to be the right price. Boots can be pricey, but some brands go overboard. (Check out the Loeffler Randall ones below) I'm willing to pay for quality, but not spend a ridiculous amount of money. They have to be trend transcendent. If I'm paying full price for something (which rarely ever happens) I want to wear it for the next ten years. That means no brand symbols, sorry Tory Burch. No crazy hardware, no booties or knee highs, no studs, and nothing else that's popularity will fizzle out in the next few years. My collection of the perfect Goldilocks boots. The Loeffler Randall and Frye boots are a bit out of my price range, but I liked them so much I decided to include them. I've ordered both the Tahari and Clarks boots from Piperlime, and I'm anxiously awaiting their arrival. Hope one pair works! What's your idea of the perfect pair of Goldilocks boots? 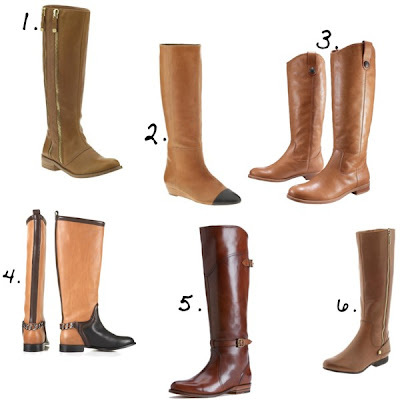 Finding the perfect pair of riding boots is exceedingly difficult! I really like the two you chose!